I know, it's been ages since I promised you this follow-up post to Quilling 101. But, like my grandma used to say, "tarde pero seguro". Which basically means better late than never, but literally means late but secure. Meaning, it took me a while but it was definitely gonna happen. It's crazy hot today in NYC and we are experiencing day 1 of a 3-day heat wave. So, for me that means day 1 of a 3-day house-bound stint. :( Might as well catch up on all the things I promised that I have yet to follow up on. First we have the tight coil. Super easy. You wrap your strip completely around your quilling tool. 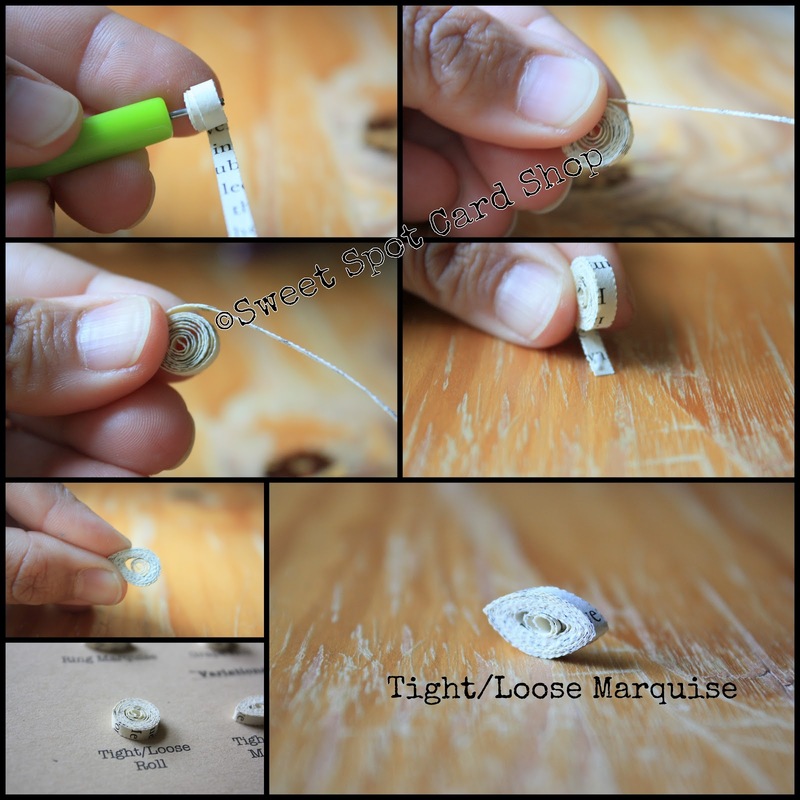 Add a ridiculously TINY bit of glue to your end and glue down. Give a little counter-clockwise twist to your tool and release your coil. Voila! These can be used as eyes, as centers of flowers, as punctuation. You can use it for whatever you like! 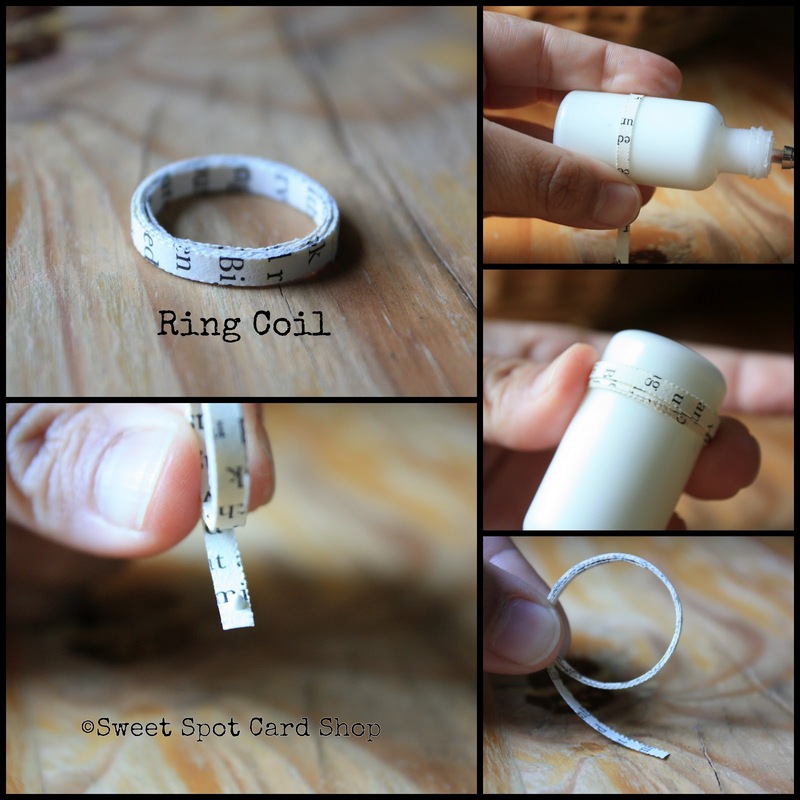 Next we have the ring coil. It's one of my faves. I use it for stick figures and to make open hearts. You need some type of dowel. 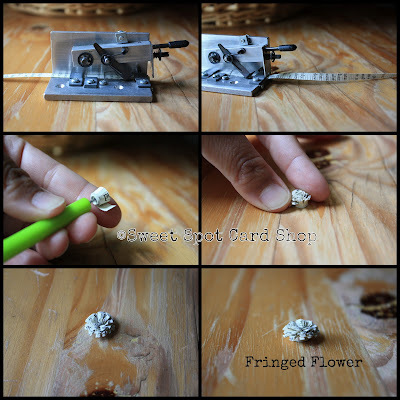 I use my quilling tool, my glue bottle or any paint brushes I have laying around. Go for a bigger dowel than your center as you can always make the center smaller but you can't really make it bigger once it is wound up. As you can see, here I used my glue bottle as a dowel. Wrap your strip completely around your dowel. 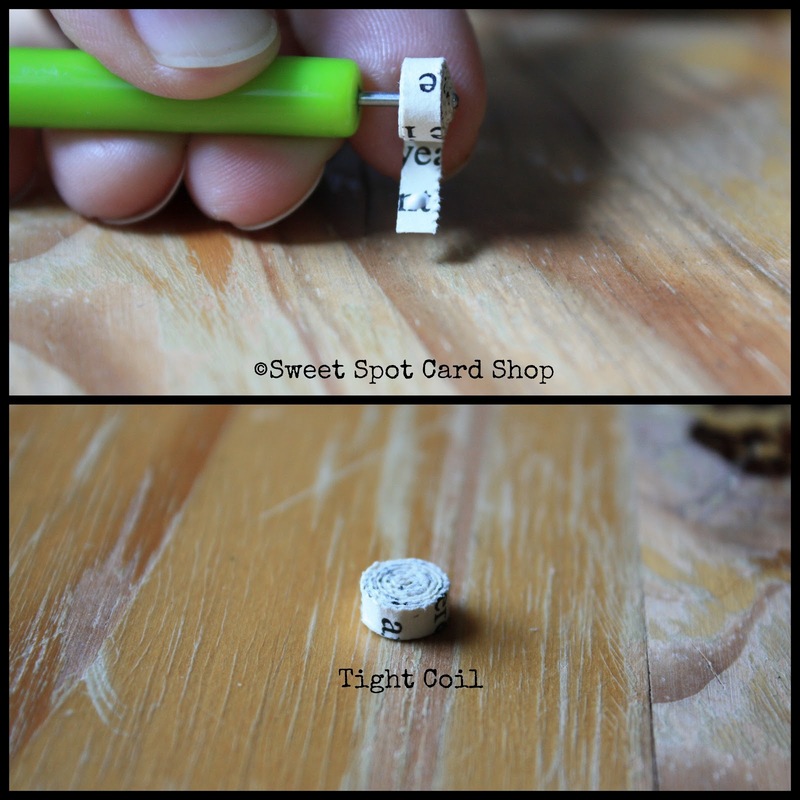 Carefully remove from your dowel and (if wanted) adjust size of circle, glue down the end. If the beginning of your strip is sticking out then you can also glue it down. Again, VERY little glue! 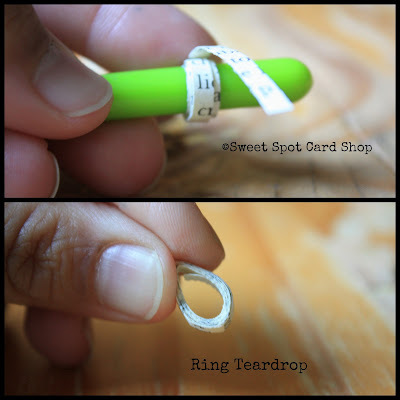 For the ring teardrop you do the same thing but you pinch one side to create the teardrop shape. Here I used my quilling tool as a dowel. You can see how the beginning of the strip is sticking out. I added a tiny dab of glue and I'm good to go. Here is the ring marquise. Same idea as the teardrop but you pinch both sides. I actually pinch them all the way down and then pinch opposite ends to reveal the marquise shape. You get the idea with this. I can show you pics of a million shapes you can make using this technique but I think you can figure it out. You can make squares, rectangles, triangles...whatever you like. Now we're gonna move on to rolls. These are awesome. I used them for my cupcake shop, for my Madonna bra and for lots of other things. 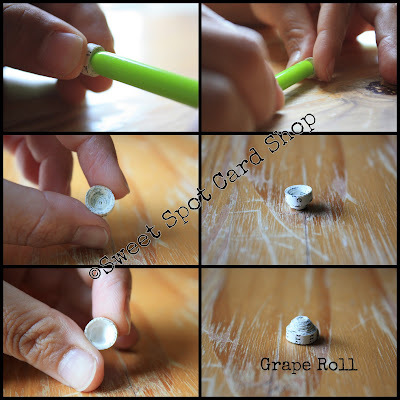 For the grape roll, make a regular tight coil, glue down the end. With the opposite end of your quilling tool you will gently press in a circular motion until you see a dome shape form on the other side. Don't rush it. You get a much nicer dome shape if you do it slowly and evenly. Once you have your desired shape you fill it in with glue so it holds. For the cone roll you do the same except you continue pressing in until a cone shape forms. Glue inside generously and wait for it to dry before you use it. These are great as the receptacle (or bud) of a flower. The next two are a bit of an oxymoron but they are exactly what I named them. Tight/loose coils. 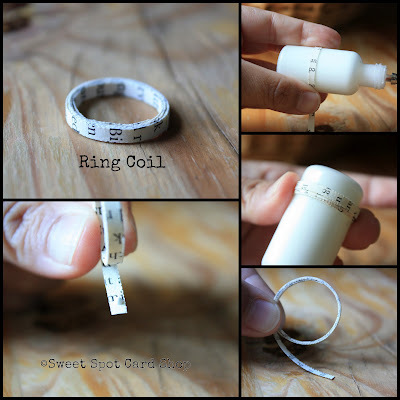 You start off making a coil halfway into your strip. Take it off your quilling tool and allow it to open up a bit. Then, you wrap the remainder of your strip tightly around the looser part. It just gives a bit more interest to quilled projects. Again, your only block with quilling is your imagination. My last tight coil shape is a fringed flower. Did you know fringed flowers start off as tight coils? Well, now you do! I hope that you're on your way to quilling many paper masterpieces and if you feel I forgot something or need further explanation, please let me know. Stay SWEET (and cool- if you're in the northern hemisphere) my peeps! You will slowly learn to control your tension. You need to relax ;) LOL! Don't roll too tight and before you remove your coil from the tool, give it a small twist in the opposite direction. This helps loosen the paper from the quilling tool. i find to let the glue dry first and then slowly from the bottom take it off. Great post Sandy! Your step-by-step and straight forward instructions are super helpful. Stay cool! Alexa, I use a hand shredder I got from Amazon. Brilliant step by step! Love your photos!! i havent done this in a while. when i was younger (probably 7 or 8) i got a klutz kit all about twirling paper. it comes with a twirler, lots of paper, glue and tons of idea's it's great for beggingers and kids love it two. I still use it once and a while and it gives easy instructions for kids to understand. You have changed my quilling life! I was stuck on 101 level quilling and trying to improvise shapes I saw in pictures without success. Thank you for showing me the tricks of the trade!